Home Featured Interview Politics INTERVIEW: Why We Endorsed APC & Sanwo-Olu In Lagos In The Last Elect – Ohaneze Ndigbo President, Solomon Ogbonna. INTERVIEW: Why We Endorsed APC & Sanwo-Olu In Lagos In The Last Elect – Ohaneze Ndigbo President, Solomon Ogbonna. 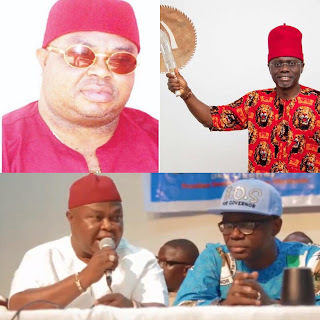 Chief Dr. Solomon Ogbonna is President of Ohanaeze Ndigbo, Lagos State, one of the flagship and biggest gathering of Igbo Associations in any part of the country and in this interview conduction by the Sun Newspapers, he spoke on why the group endorsed the All Progressives Congress (APC) and its Governorship candidate, Babajide Sanwo-Olu in the governorship election in Lagos. He also spoke on the allegations that the APC candidate gave him and the Ohaneze Ndigbo a whooping N250 million to get their endorsement. Q: Ohanaeze supported the Peoples Democratic Party (PDP) candidate, Jimi Agbaje, during the 2015 governorship election. How come it endorsed the APC candidate, Babajide Sanwo-Olu in 2019? Politics is dynamic; and so are the politicians. I supported Jimi in 2015, but a lot of things have happened since then, including the fact that I was elected President of Ohanaeze Ndigbo Lagos State in 2018. My political decisions must take into consideration, the interest of my followers. A critical analysis of the politics of Lagos State shows that PDP has been in opposition in since the inception of the present democracy. So, whoever is supporting PDP in Lagos State is automatically in opposition. Furthermore, the APC- led government in Lagos State has not been doing badly, and we need to support it. The Igbo living and doing business in Lagos have to join the moving train. So, in 2019, we took decision to vote for the APC candidate in the governorship election. But the national body supported PDP, why did you go against the position? Ohanaeze Ndigbo national did not support any political party, but endorsed the presidential candidate of PDP. The endorsement was for Atiku/Obi presidential ticket. At the governorship election, the politics became local, and it was for the individual local branches to take decisions that best suited the Igbo in the respective localities. So, my decision to endorse Sanwo-Olu was in the best interest of the Igbo in Lagos State. We have to identify with the government of our host state, so we can derive maximum benefit from the administration. Is Sanwo-Olu carrying you along in his plans for Lagos? The carrying-along is not for me as an individual but for the Igbo as a group. We expect favourable government policies and programmes for all Lagosians including the Igbo. We look forward to a healthy inter-face between the Sanwo-Olu- led administration and Ohanaeze Ndigbo in protecting the lives and properties of our people in Lagos State. We expect that our trading points and the market places will be made conducive for business. We are also confident that the Igbo will be well represented in the Sanwo-Olu- led administration. There is this allegation that Sanwo-Olu gave you N250 million to endorse and mobilise Ndigbo for his election. What is your response? First of all, the APC administration frowns at money politics, and that is the reason, the security operatives seized huge sums of money brought into the country to monetise the electoral process. There is a ceiling to the amount each candidate can spend. So, I wonder, how much billions of naira it would amount to, if Sanwo-Olu was sharing N250m to each individual or group. So, the allegation is laughable. So how did the allegations come up, what could be the motive? First, they are political touts, mainly the PDP and the All Progressive Grand alliance (APGA) supporters, whose intention is to destabilise Ohanaeze Ndigbo Lagos State in particular and Ohanaeze Ndigbo worldwide in general. These are Lagos-based political touts, constituting themselves into a cabal with the intent of controlling every sphere of Igbo affair for their personal gains. They are self-acclaimed redeemers of the Igbo in Lagos and the champions of the mission to uproot APC administration in Lagos State. They want to hijack Ohanaeze Ndigbo, Lagos State, pose as APC supporters, thereby gaining information to thwart and discredit every Lagos State government programme, no matter how laudable. In any case, their plot has been exposed, and their identities revealed even to the incoming governor. These infiltrators, pretending to be APC supporters are still dwelling in the past. We are not bothered by their cheap blackmail, as our focus is marshalling strategies to support the Sanwo-Olu administration in delivering the dividends of democracy to Lagosians. They are equally working to replace Enugu with Lagos as the national headquarters of Ohanaeze Ndigbo. In their reasoning, Lagos is the financial nerve centre of Nigeria and therefore best suited to host the Ohanaeze head office. Their target is to neutralise the powers and authority of President-General. Their plan will never materialise. There is also this allegation that the governor of your home state, Ebonyi is not in support of your leadership of Ohanaeze? Governor Dave Umahi is very credible and one of the best governors in the country. He is my governor and anybody trying to create enmity between us, is making a huge mistake. I hold him in a very high esteem and he loves Ebonyi State. He encourages all indigenes of Ebonyi state to aspire to be the best at their chosen vocations and good ambassadors of our state. It is total falsehood and figment of the imagination of the peddlers of such news. The governor will never kick against the achievement or attainment of any height by an indigene of Ebonyi State. So, such news is fabrication, as the governor cannot run down any Ebonyi citizen. Who are your heroes among past Nigerian leaders? The leaders, I admire most in Nigeria include Commodore Ebitu Ukiwe, the former Chief of Staff during the administration of Gen. Ibrahim Babangida, former Lagos State governor, Lateef Jakande, National Leader of the APC, Bola Tinubu and former Military Head of State, Abdulsalam Abubakar. Ukiwe is one of most humble Igbo leaders I know. He interacts freely with people irrespective of your status. He is a leader you can walk up to anytime and he will attend to you. Jakande’s records of achievements in Lagos speak volume. The Jakande estates scattered in various parts of Lagos offer affordable houses to Lagosians. Tinubu proves to Nigerians what it takes to be a progressive politician, remaining steadfast in your ideological pursuit against all odds. He was leader of opposition for 16 years; something lacking in most Nigerian politicians. Most Nigerian politicians are fair weather politicians, jumping from one party to another, as they seek patronage. Many people including the Igbo wonder what makes him thick and endear him to his kinsmen. His strength lies in the masses of his people who have benefitted and still benefit immensely from his political know-how. Culled from The SUN Newspapers.